TheAptomStrain had the most liked content! That's a really good vs. match idea! I'm really tired and going to sleep and I'd like to elaborate more tomorrow but really quick if they're fighting on Earth(which I assume should be the best place as Sho hasn't fought in space yet), if Exceed can last 3 minutes he's won lol. I do enjoy Cosmos for that exact reason, and yes he's the only one who's first thought isn't "kill the kaiju" and it's definitely a trait to be admired. I also like that his main form is blue as opposed to most that is red. I'm at a loss for words that the Ultra series doesn't have it's own thread so I'll start it off Let's discuss all things Ultra! I'll start off by listing my favorite series, and why I liked them Ultraman Leo - Talk about brutal! You have, among other highlights, a crippled Ultraseven stuck in human form, people crushed, stabbed, shot, sliced in half, team members dying in combat, the whole team is later killed except for the two main characters, graphic kaiju combat and even the graphic dismemberment of a key character. Ultraman Nexus - Amazing series. Deeper stories and slightly more compelling Kaiju. Completely dark in tone compared to earlier series. Too bad it was carped by the network by putting it on the Saturday morning kid's block (they wanted to air it on prime time) Ultraman Mebius - Another one I liked, though not as much as Leo and Nexus. Great storyline. Super fun to see all the Ultra brothers return to show the rookie what's up. And all of Mebius's forms are really cool My favorite Ultra has to be Ultraman Zero, son of the amazing Ultraseven and possibly the strongest Ultra besides beings like Ultraman Noa. He has an amazing design and when it first leaked I knew he had to have some relation to Seven due to his double eye sluggers and solar panels on his body. I think his first appearance in MMB:UGL was amazing but the subsequent two movies he was featured in just couldn't compare. Also after owning several Figuarts and Ultra-Act figures, I definitely believe a Ultra-Act is the superior line. Welp, I've said my piece! Looking forward to everyone's thoughts about the World of Ultra! This is my first time typing any blog of some sort. I don't have any social networks as I prefer to actually go out and live life. My first attempt at blogging starts now I can't believe what the forum has become. First off with buying the books to get the scans. Guyver is an extremely underground manga and we should be stoked that anybody is reading it. This is seriously the smallest forum in existence. And we shouldn't be charging $22 for a book that cost $7 in Japan. Also, I feel like I'm the only one who's pissed off that fact that almost every post is a back and forth between largest planet and the guy obsessed with Shizu and they don't even acknowledge anybody else. And all they do is agree and like everything they post. Kind of a stupid way to get rep. That's what personal messenger is for. They talk to nobody else yet they keep upping their post count just to say things that could have been a private message. And what the hell is this obsession with Shizu? It's one thing to like a character, but everything he says links back to her. No matter what topic. We could have a thread about favorite colors and he'd probably post Shizu's favorite color is in his fan fic. I guess I'm just disappointed with this board. I miss the old days when everyone talked about Kamen Rider W and the latest Guyver chapter that anybody got to read. All honesty I just don't trust anything said by anybody who wasn't reading Guyver Advocacy after 2008. I just miss having actual conversations with people who have been around for a while. Where the hell is the Tinned Meat section?!? That's all for now. I'm sure I'll have more stuff to complain about in the future. If it's Murukami/Imakurum, then he has a weird way of looking at things. It's been stated a bunch of times that they need all twelve Zoalords. It would make sense if he went after the Rogues, but he hasn't. He just collected Khan's crystal and not the others. Purgstall, Li Yentsui, and Waferdanos were all loyal to Alky, so it makes sense to retrieve their Zoacrystals (as if to find new hosts), but why take out Caerleon? He was extremely loyal. If he was Imakurum or working for Alky, why couldn't he just explain to Caerleon that he needed them for some reason? I find it extremely hard to believe that Imakurum would go after Caerleon before going after Kurumegnik and Jabir. Not true. Sho didn't notice Gastal until Aptom started to absorb him. Sho wasn't able to see Evil Aptom either. And Val didn't notice Aptom while she was fighting the Enzyme III's. I think you should read over the manga again before going on about how "full-proof" Guyver's senses are. I know he got the high frequency lance from a hyper zoanoid(I forget which one) during the time Khan was controlling his body.And with his fight against the Libertus, he has now shown the ability to change the function of absorbed weapons. Yes he got the high frequency lance while under Khan's but it's left ambiguous who he got it from, along with his spiked ball arm, since those Hyper Zoanoids didn't get data files. The only reason Zangallo and Billfinger are confirmed is because we saw them and the molecular accelerator is from Zangallo, and his right arm is clearly Billfinger's. And yes about changing the function. Khan's version was a stabbing weapon with all the power focused on the tip, while Aptom's can slash and acts more like a standard high frequency blade. Video Games What Are Some Of Your Favorite Video Games And Why? The Tales series in general but Tales of Vesperia is easily my favorite in the franchise. Also love the Kingdom Hearts series with Dream Drop Distance being my favorite. I actually prefer the handhelds over the actual console games in that series. My favorite Final Fantasy game is IX. Love Dissidia as well because I get to play as Kuja. Any game by SNK with Garou: Mark of the Wolves being my my favorite. Xenogears is one of the greatest video games of all time and I believe Xenosaga is a disgrace to the Xeno name. Love Mega Man X, but only X1-X5, perfect stopping point for Mega Man Zero to take off. Dragon Warrior III was my first RPG that I had myself and wasn't owned by my older brothers so I'm still wishing the 3DS version of Dragon Quest VII will make it overseas. Twilight creatures vs Guyver creatures, and my idea for the "ultimate battle creature"
My mother's a librarian at a high school so I'm well versed when it comes to teen fiction. I'll go along with your gross over-exaggeration of a twi-pires strength and compare them to a Libertus. So they are at the same strength and fighting ability as a Libertus. The Libertus can always switch to Mode B and fire their bio-lasers, all over-exaggeration aside, no character in the Twilight franchise can stand up to any form of laser/beam weapon/particle cannon. Also you need to keep in mind that this Camel character is completely made up by you and not created by the creator of the franchise Stephenie Meyer, therefore he can't be compared to characters from the Guyver franchise created by Yoshiki Takaya. You just made up a guy who's all powerful who has all these great abilities. It's be like I created my own fan fiction where Aptom was able to absorb a Zoalord and also got his hands on a Guyver unit and compared his strength to actual canon characters. It's just really silly. Your Camel character is not real, you made him up for the sake of your fan fiction, therefore he can't even be brought up in a discussion of vs. match between the canon characters of Twlight and the canon characters of Guyver. The Thancrus was just his shape shifting ability, don't forget he was also Imakurum during that "fight". 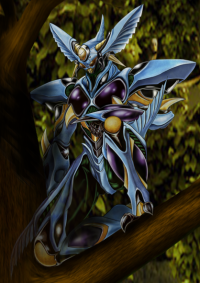 Also masqueraded as Guyver III when first attacking Sho and Mizuki. The only ones I'm positive about are Enzyme II, Gregole, Vamore, Elegen, Ramotith, Gaster, Derzerb, ZX-tole, Rocies, Gastal, Bilfinger, Zangallo, Vikarr and Bio-Freezer. Still trying to figure out where he got the high frequency lancer. I know he doesn't actually forget them. That's why I put forget in quotes. I'm making a joke about how whenever he gets a new form, he completely disregards the abilities from the prior form. When's the last time you saw him use Gaster's Bio-Missles, or Elegen's discharge, or ZX-Tole's flight or beam weaponry? I never looked at the Gigantic's color scheme as yellow but as an aged white or ivory. While the Gigantic Dark is Black. I think of it like the Mrk. II from Zeta Gundam. The Heroic A.E.U.G. version is white while the villanous Titans version is Black. Not saying Agito is flat out evil but you get the gist. There's a reason Exceed is red, google search "Law of Chromatic Superiority". The same could be said about Aptom while he was decidingly monstrous in appearance while he was a villain of the villains, when he got absorbed ZX-Tole's leg he gained the insectoid face (mark of his new found heroic nature) and a dark color scheme to signify his anti-heroic nature, While he was under Khan's control he reverted back to the monstrous face that composite form and trinity blast had. Omega Blast has a baby blue color schemes along with the insectoid face to complete the anti-hero to full blown hero turn.